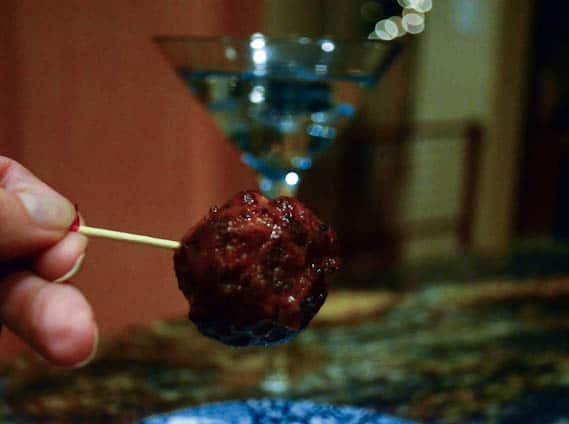 Get these Crock-Pot Cocktail Meatballs started a couple of hours before party guests arrive and they will stay warm and ready to serve in the slow cooker throughout the duration of your gathering. 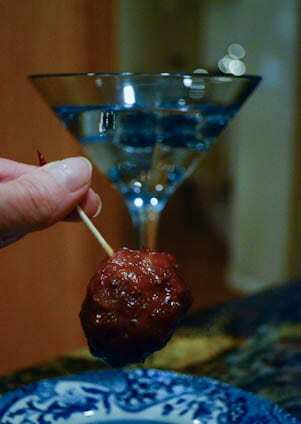 If you’ve been to enough parties, you’ve probably come across a variety of different cocktail meatballs. This is my take on this classic party snack. 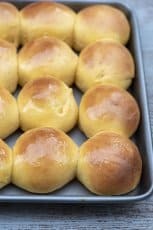 I frequently include these on my party menu because everyone loves em’ and they are so darn easy to make. Preparing them in your Crock-Pot means you’ve got one item checked off your list hours before your party starts and they will stay warm and tasty throughout the night. They are sweet and tangy with a bit of a kick. Perfect party food! 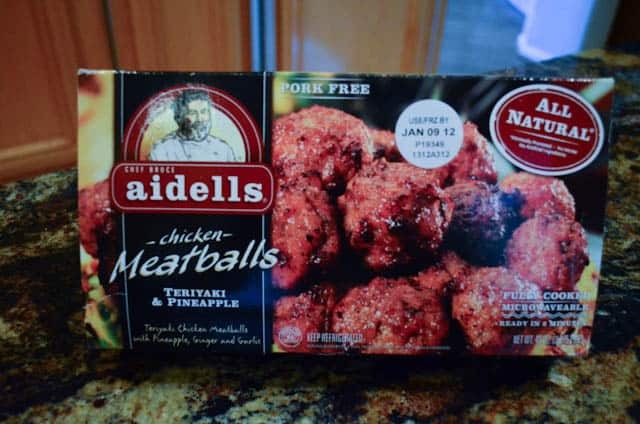 I’m absolutely and totally out of this world crazy for these Aidell’s Chicken Meatballs – Terriyaki & Pineapple. 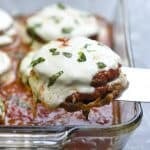 They are super delicious and as an added bonus, far lower in fat and calories than your typical frozen meatballs. I find this big 46 ounce package in the refrigerated section at Costco and it’s exactly the right amount for this recipe. 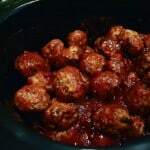 You can use any prepared meatballs that suit your fancy, or you can make some from scratch (click here for my recipe). Using prepared meatballs makes this recipe incredibly fast and easy which means more time can be spent on the rest of the menu, or cleaning and rearranging the pantry, or organizing your sock drawer. Enough about my exciting life, let’s make us some cocktail meatballs! Here’s what you need to add to your grocery list: a package of meatballs (2 to 3 lbs. ), a 14 ounce can of jellied cranberry sauce, a 12 ounce bottle of chili sauce, Dijon mustard, brown sugar, and a lemon. 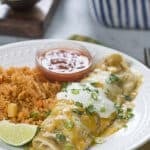 A note about chili sauce – don’t confuse it with cocktail sauce. Heinz makes them both and they come in identical bottles so be sure you’ve got the right thing. You should start these about 2 hours before your party. Mix all the sauce ingredients together in a sauce pan and allow it to simmer for about 5 to 10 minutes to break down the cranberry sauce. 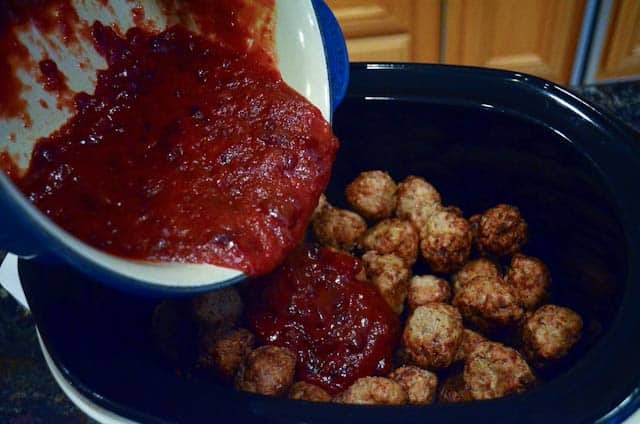 Pour the sauce over the meatballs in your Crock-Pot and set it on low. Mix them up and put the cover on. If you are using frozen meatballs there is no need to thaw them first. I’m telling you – it doesn’t get any easier! Get the shaker out and let the party begin! 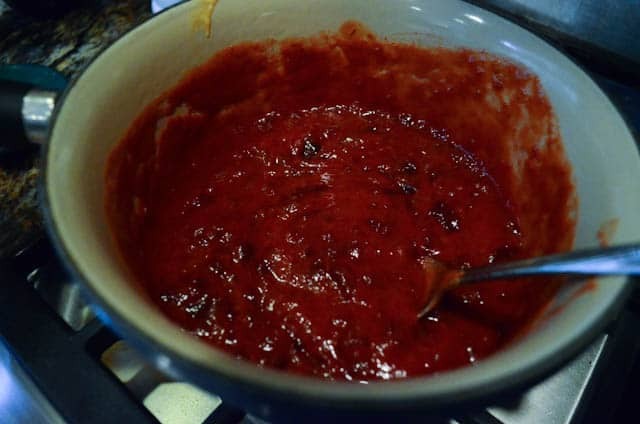 In a saucepan mix together cranberry sauce, chili sauce, Dijon mustard, brown sugar, and lemon juice. Mix to combine and allow to simmer, stirring frequently, for about 5 to 10 minutes to allow cranberry sauce to break down. Place meatballs in a Crock-Pot and pour the sauce over. Mix well to combine. Set Crock-Pot to low, cover and allow to cook for 2 hours before serving. If using frozen meatballs, allow them to cook for 3 hours before serving. Keep Crock-Pot plugged in and on the warm setting throughout your party and serve the meatballs from the Crock-Pot. this is such a fantastic idea- thanks! These look perfect for entertaining! 🙂 I really need to get on the crockpot bandwagon… if only I had time! omg! LOVE LOVE LOVE bbq meatballs! The crockpot is a great idea for new years, for sure. 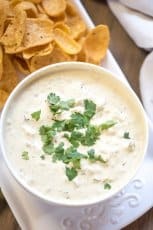 What quick and tasty party food! 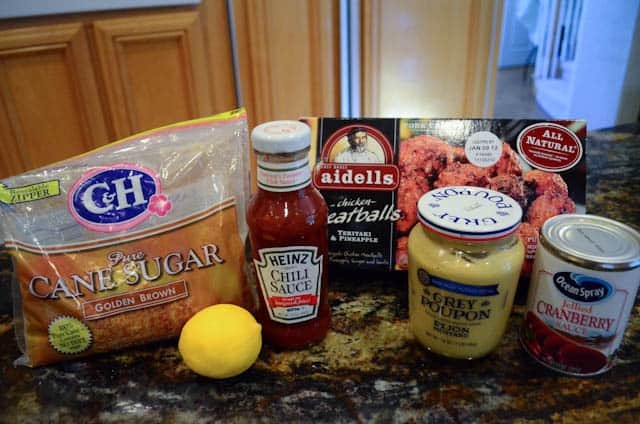 I’ve never tried those meatballs but they certainly look good and that sauce – awesome! Happy New Year Valerie! I’ve literally been craaaving crockpot meatballs. These look great! These are always my favorite party treat!! Happy New Year! 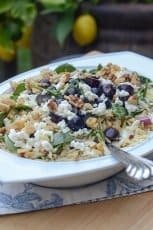 Great recipe for entertaining and upcoming New Years celebrations! The ingredients tell me that this has just the right amount of sweet to spice ratio-yum! I could put away quite of few of these gems. Great post! Happy New year! These look easy and yummy! I’m always looking for good finger foods/apps this time of year. Football playoffs and Oscar parties are on the horizon for me! I am a HUGE fan of the Oscars! So looking forward to all the fun Oscar night recipes to come. thanks for this awesome recipe. I found the meatballs at Costco and am making them for our Christmas Cocktail party tonight. Thanks! You’re very welcome Mary Beth. I hope everyone enjoys them as much as we do. Have a great time! 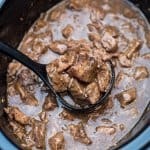 I love crock pots…they are the perfect addition to any winter weekend. YUM!! 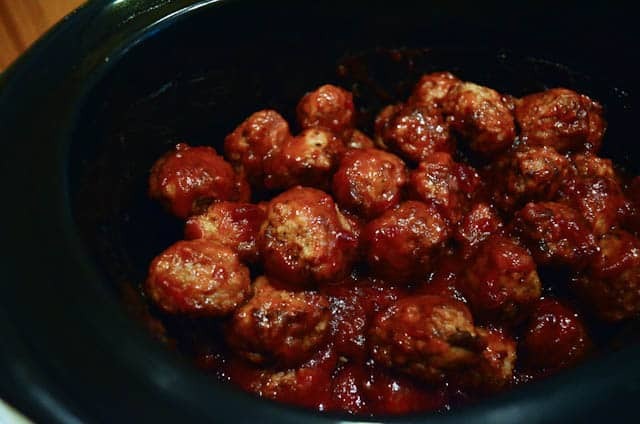 wonderful meatballs in a crock pot. making my life just a little bit easier. Seriously AWESOME! 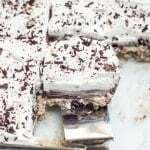 Served these at a bday party and they were a huge hit. I was asked to make them for EVERY future holiday party! So glad to hear it Casey! I’ve made a sweet & sour with 3 ingrediences…. I dump everything in a crockpot and let cook about 4 hours … We eat these with Pinto Beans& rice….love them! Did you cook them on LOW or HIGH for 4 hours? A quick, simple, and delicous recipe. I’ve made these about 5 times and they are the surefire party hit. I’ve even been asked to make them again for Thanksgiving this year. Thanks so much. These look great. I hope Costco’s in Birmingham, AL. has the meatballs so I can pick some up in a couple of days for New Years. How tasty your dish is! I love the color of it so much. 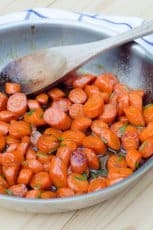 Can i use 1 tablespoons honey instead of 1 tablespoons brown sugar for this recipe? My meatballs needed a little more time on the LOW setting 2 hours was not enough barely coated my meatballs. should i just cook them on high for 3-4 hours? 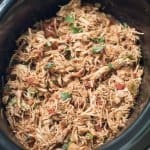 How big of a crockpot do you recommend? 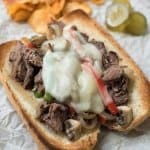 I used my trusty 6 quart slow cooker for this recipe.